Size: 42 x 50 cm. A very decorative map of Nottinghamshire from the famous Blaeu firm. The map has a decorative title cartouche with figures of harvesters, a scale cartouche, a Royal Arms and the Arms of England with supporters. There are six coats of arms of the nobility and two blank shields. 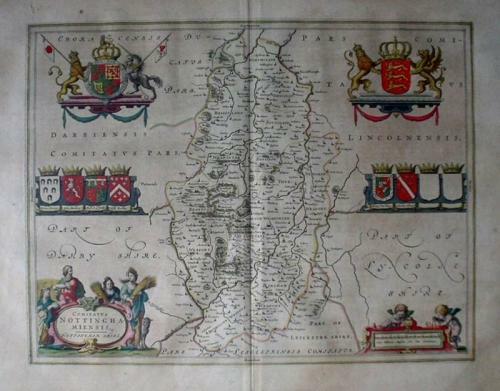 The map is in very good condition with only minor foxing at the left margin (well away from the engraved area).